The Barcrest slot Wipeout is available for mobile and tablet devices. Those that have played it online will be pleased to know that the two games are very similar. For the purposes of this write up I will be talking about the mobile version. The theme of this slot is surfing (there is a big giveaway in the name), with some opportunities to win big in the free spins bonus. To activate the free spins bonus round you will need to land 3 or more FreeSpin symbols on the reels in any position. The more you land the better your rewards. Firstly you will receive a bonus of 5, 25 or 250 times your stake depending on how many scatters you land. You are then granted 3 lives, which you need to keep hold of for as long as possible to win big. The wipeout symbol will take off one of your lives, but they only appear after the first 5 spins of the bonus. During the free spins you can pick up extra lives with the Extra Life symbol. If you manage to survive for 25 free spins then you will pick up a bonus of 20 times your stake. Get to 50 and this is increased to 200x! 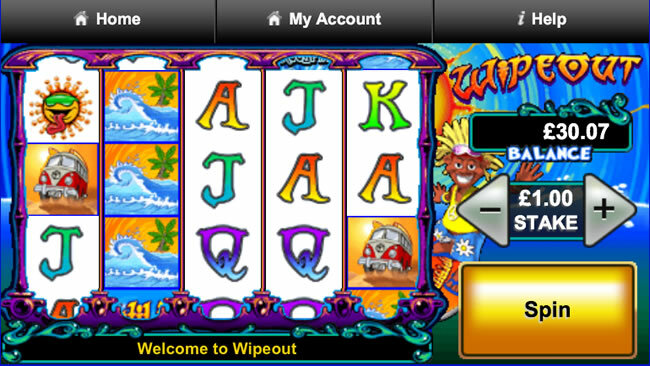 Although I cannot claim to have ever reached this total (the best I have had is about 28 free spins). 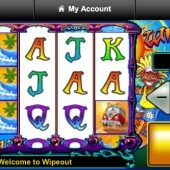 The mobile version of Wipeout has been solely designed for mobile devices as far as I can make out. When I load it onto my tablet device it only fills about half the screen and looks slightly stretched. I don’t know if the developers at Barcrest are going to change this, but I would probably only consider playing Wipeout slot on my mobile at the moment.